Happy Saturday! It's that time again...time for another challenge in the new Compendium of Curiosities III Challenge!!! Those of you that play along every time deserve a big round of applause, AND those of you who are new to the challenges deserve the biggest clap! Thank you for inspiring us as well, and for all the wonderful comments! The Curiosity Crew and I always love all of the entries! This new challenge, number twenty-five is using the Frameworks Dies. These are a cool product and very unique when it comes to dies. The possibilities using them are endless. I am so looking forward to all the entries. Please play along so you can win some fabulous prizes donated by the ever generous Tim and Mario, and this challenge's sponsor, Inspiration Emporium!!! You will have two weeks to complete this challenge and link it up to the CC3Challenge site, and you can read all the rules here. Please take the time to visit every member of the Curiosity Crew (See below.) for not only some gorgeous die inspiration, but for a chance to win some extra goodies! Okay, seriously...don't you just love the Bird Crazy Stamp Set from Tim and Stamper's Anonymous??? I can watercolor them all day, and make up all kinds of stories and comics using them. I want to dress them all up! Seriously FUN!!! Tim put out a great Blog Worthy Links using these, so check that out if you haven't already, for some awesome inspiration. Sorry, I got carried away. Back to Frameworks Dies!!! I used them to gussy up some Easter Eggs on these cards for my parents and inlaws, and one for me because I LOVE them. Aren't they perfect for the job? They would be great on real or paper mache eggs too! They transform any project to a WOW...very have to have dies I say! I die cut the Sized Ovals for the eggs, and various Frameworks all using Manila Cardstock from Ranger. While mulling over what I would do with all this...yes, sometimes I roll like that...I started the background. I wanted to do Tim's Faux Batik technique, on the background, so I started with stamping the new Floral Background from Tim and Stamper's Anonymous, using Tumbled Glass Distress Ink onto Manila Cardstock. Then I heat emboss it with Ranger's Clear Powder. I wanted three cards, so I made two more. I inked over the backgrounds with more Distress Inks. This was great as it was, but I continued on. I set my iron on high, and placed the cards between newsprint sheets, and ironed over them. Doing this lifts away the Embossing Powder onto the newsprint. Even the newsprint is pretty, and I will use this for something else, as my hoarding senses tell me. I stenciled on the flowers using the new Blossom and Wildflower Layering Stencils using Mowed Lawn Distress Ink. The layers you achieve using the Faux Batik are wonderful. I figured out where I wanted to go with my eggs, so I colored the eggs with Distress Spray Stain. So easy. I used the other background image called Dots from the set I used with the Floral. I can tell these both will be stamps I use a lot. I stamped all the eggs using it with Glacier White Pigment Ink. Then I added the Frameworks Die pieces to each egg. I stamped and heat emboss with Clear Powder, the birds onto Watercolor Paper and Jet Black Archival Ink. I watercolored them with Distress Markers and a Water Brush from Ranger. I cut them out. I die cut the grass from the Tapered Fringe Die using Kraft Core Cardstock. I stamped and heat embossed in Clear Powder the sentiment from Handwritten Sentiments...another new favorite...using Jet Black Archival. I free cut some bows for the birds heads, colored them with Distress Markers, and gave them and the eggs some Stickles treatment. Then I adhered and foam dotted everything on the cards. I LOVE them!!! A million birdy captions came to mind while putting these together...some not very appropriate! ;0) The Bird Crazy set is stinking FUN!!! I really hope you play along with this challenge, as I want to see and be inspired by your Frameworks creations! AND...if you don't have the Bird Crazy set, you really need to try and get them. You will love the fun you will have playing with them. I hear them calling my name again...off to play! Absolutely stunning.Great background and colours .I really love all of it. I just love the birdies & the way they can be so much fun - these are adorable with their little bows! Another awesome piece, dear Anita! Great bright colours and fantastic combination of images and cuts...your colouring of crazy birds is fabulous, too....I love it! I think your bacground is genius. I have just purchased both the stencil and the stamp set and have had a play in my journal with it. I love the colours you have chosen and these little birds on their Easter eggs are priceless. EEK...These are soooo flipping cute! I love your Easter eggs. Now why didn't I think of that. Fabulous inspiration and your bird crazy birds are adorable. Ugh, I miss playing. Must find more time! Thanks for sharing your great tutorial. I am grinning from ear to ear! These are so fun, so fabby, and just so....HAPPY! The batik background is just off the charts beautiful, and I love the stenciled layer over the top. But those crazy birds, and those fancy eggs...they make my heart smile! What a wonderful, whimsical card! Thanks for sharing it! Oh Anita this is one of the best Crazy Bird projects I have seen so far and I adore how you used the frameworks to decorate the eggs! Brilliant, funky and fun, love it!!! Anita...these are fabulous! I love those crazy birds and how you have given them such a great life on this ultra cute design! So bright and creative! They make you smile just to look at them!! Fabulous use of the frameworks, too! You rocked those stamps!!! Fantastic work as usual!! These cards are just too cute! Love your background and of course those crazy birds. You set the bar pretty high for the competition. Omg too cute crazy Birds with bows <3 ! Love your cards; so many cool techniques; love how you used trellis and courtyard frame words on the eggs, so fun, bright festive eggs ! You makin' me want to play all day ! Yes Anita! Love your bright colors and the little bows are precious. Each bird proudly displaying their Easter egg. Your background is gorgeous too. Love everything about your card. I did see Tim's post. These little guys are definitely a hit! Did you see them on the new aprons at Stamper's Anonymous? Too much fun. 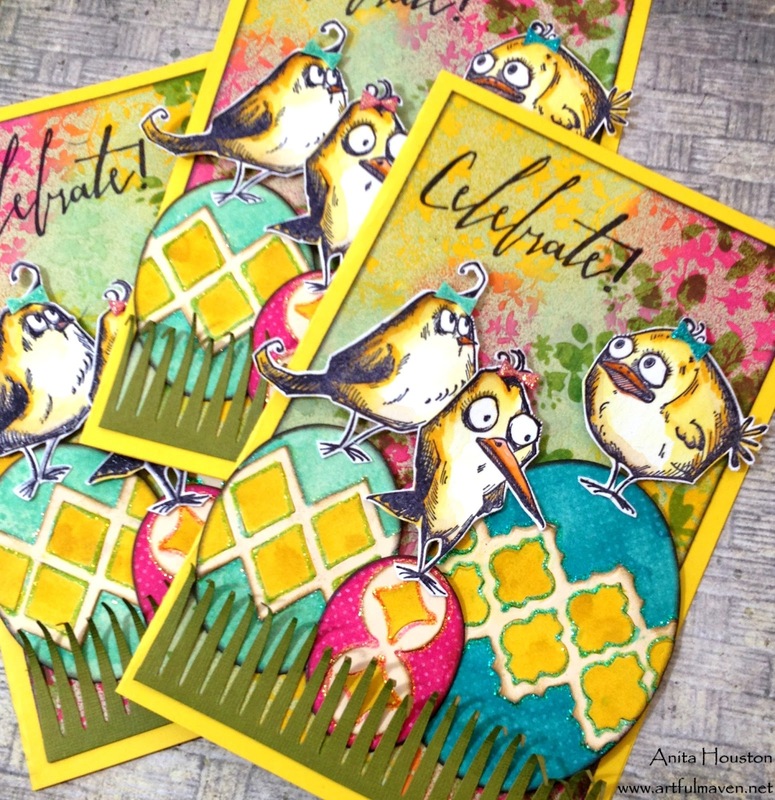 Great cards with those crazy birds on their too big eggs Anita...lovely in these great bright colours! Oh my gosh, those are wonderful! Love those Crazy Birds, make me smile each and every time i see them :O) Thanks for sharing your techniques, wonderful inspiration! Well, you DEFINITELY answered my latest Q as to "If I decide to get ALL the frameworks dies....what exactly would I DO with so many different ones?" I kept wondering if I'd ever make ONE project that would use ALL the dies at the same time. Your eggies are SUPER COOL!!! And they really ARE cute enough to maybe plan next yr for cutting several out for the Sunday School kids to easily put together as a way to give them ideas on papercrafting without anything but PAPER & GLUE. NICE JOB on this, indeed!!! Gotta love those crazy birds and your cards are absolutely adorable. Love how you used the Framework dies to accent your eggs. Lovely background and what a funny idea to use Framework dies as decoration for the Easter eggs!! These are fantastic cards. Gorgeous idea to take the crazy birds for Easter work. These cards are so awesome Anita! I just love those birds!! Adorable, love the colors and stamps! Quite possibly my most favourite Easter project EVER!! These cards are gorgeous; beautiful background & eggs & the birds are wonderful (I love the little bows!). I have got to get this set as soon as I can. LOVE this! How fun and happy! I love the fun use of the frameworks for the eggs, such a cool idea. I now have the birds and those stencils, I need to get to work using them! Those faces crack me up! These eggs are fabulous, so much nicer than the ones you can buy. Love the little bows on the birds, these birds are hilarious have to get them! SERIOUSLY!!! These are SO fun, Anita. I love that Batik effect for the background. One of my fave techniques from Ranger U. And just when I think I don't care for bold bright color, you completely transform me into a fan after seeing these creations. You're a clever chickie using the frameworks dies for your egg decorations. Absolutely knocked it out of the park with this challenge! You are such an inspiration, girl. They crack me up. It's like they're saying, "So...what now?" I love, love, LOOOVE the bows...that's so stinking adorable!!! LOL. Oh yes indeed, Bird Crazy is definitely the star of 2015's releases! I absolutely love love love it! I never thought to try the frameworks on a 3D object like a papier mache egg! Hmmm! Given how great it looks on "flat" eggs, I agree, it would be wonderful! This is so stinkin' cute. Love the birds (yes I had to have them), and the frameworks (those too) and the colors and the...well you get my drift...LOVE this! Ohhhhhh that beautiful backgrounds! Wonderful and original idea to use Framework dies as decoration for the Easter eggs !! These are so stinkin' cute! The little bows really are killer. Great idea to use the Frameworks for the eggs! I am looking for ideas for these dies and I know the Curiosity Crew never fails to inspire! Anita, these are the cutest eggs ever! Love that you used so many different Frameworks dies. And I can't stop smiling at the bedazzled bows in the chicks'hair. I absolutely love the Crazy Birds. Your colors and Easter eggs are beautiful! When scrolling and admiring all the cc3c hoststess' pieces I literally stopped and yelped "how CUTE" when I saw this. Love how you used the dies and the color. OH my, from those decorated eggs to those crazy birds, this is adorable! Love that you placed the birds on the eggs and even added some grass! Love this, Anita! SO cute! love the bows in the birds 'hair'!! Your cards are fantastic! Perfect Easter cards. te frameworks do make perfect egg decorations..I never would have thought of that. and I just got the bird set...having a ball with them too. Your card is absolutely adorable!! The eggs are adorable!! I love the background with the stencil. The crazy birds a awesome!!! These birds slay me! I haven't put my hands on them yet, but I can't wait to get them. Such a cool use of the technique this go round. Another stunner from you, Anita! Absolutely amazing! What a fantastic color explosion there! Oh, I love your little bows and my favorite Birds crazy stamp set! Yes, you are so right. The birds are just too cute for words. I love how you dressed them up for Easter and they made great toppers for your lovely eggs. Loved all the colors and texturing. I have never wanted these birds more! And your tiny bows are adorable. So sad one of these didn't fly into my mailbox. Oh my goodness soo adorable!! I always love your creations Anita! I used these birds on my moms birthday card and she adored it, There so whimsical! Oh, I love that fun and playful approach to the cool frameworks, Anita! Love that Bird Crazy set and you have certainly put it to excellent use! I'm afraid if I had it, I might never come out of the Closet! Another home run from you, Anita! Another stunner is right, I love what you've done with these birds. I had a "crazy" thought and didn't think I needed them....NOT. Off to fill up another cart (Tim should give you commission lol). LOVE these!! !